The Eight of Cups shows a man walking away from eight stacked cups in the foreground. There is an eclipse in the sky. Traditionally this card represents the completion of something or of a phase of something. He has turned his back on whatever the cups represent for him and he’s headed up the mountain for a new perspective. It is difficult in life sometimes to know when something is finished. We often hang on far too long. This card suggests that the time is now to move on. You’ve done all that you can do. 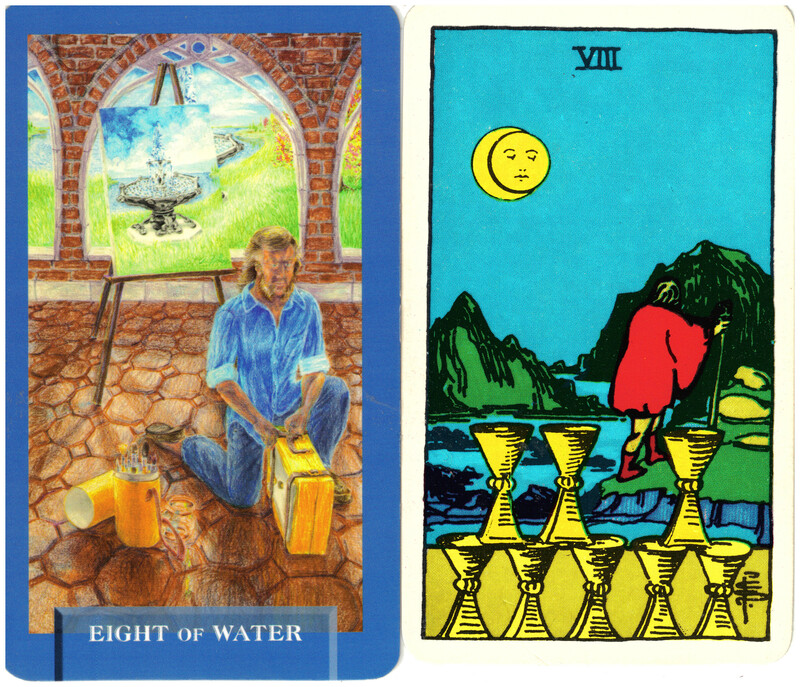 The Eight of Water from Today’s Journey Tarot shows an artist putting away his tools after completing his painting of the fountain. He is satisfied that his work is finished and has also turned away from it. It takes honesty to see this point sometimes, but when something is over, it is over. It is time to move on.